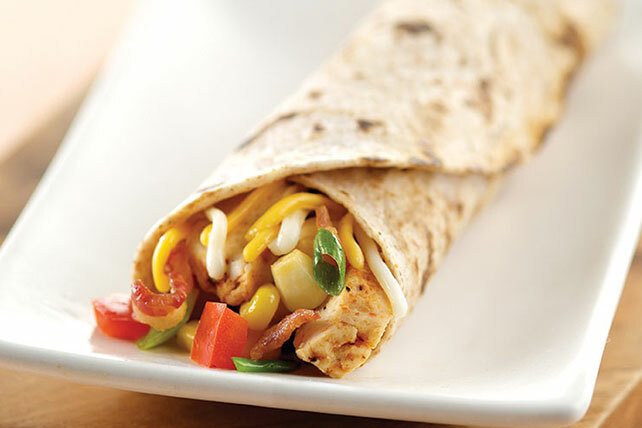 Roll up some tender chicken with bacon, corn, salsa, peppers & cheese in a whole wheat tortilla. Bacon, Corn, Salsa and Chicken Roll-Up makes a tasty wrap. Cook bacon in medium skillet on medium heat 10 min. or until crisp, stirring occasionally. Use slotted spoon to transfer bacon to paper towels to drain. Discard all but 1 tsp. drippings from skillet. Add onions and peppers to skillet; cook and stir 5 min. or until crisp-tender. Add chicken and corn; cook 5 min. or until heated through, stirring occasionally. Stir in bacon. Spread tortillas with salsa; top with chicken mixture and cheese. Roll up. Add 2 thin avocado slices to each tortilla before rolling up. Prepare as directed, using OSCAR MAYER Deli Fresh Grilled Chicken Breast Strips and substituting your favorite flavor KRAFT Barbecue Sauce for the salsa. Heat tortillas as directed on package before using as directed. Stack bacon slices, then use kitchen shears to cut the bacon into 1/2-inch pieces. Prepare as directed, substituting 16 slices OSCAR MAYER Deli Fresh Oven Roasted Turkey Breast for the chicken breast strips. Prepare as directed, substituting 4 large lettuce leaves for the tortillas and folding in both sides of each lettuce leaf as you roll it up. Prepare as directed, using one of the following flavor options: Bacon-Corn Salsa and BBQ Chicken Roll-Up: Use OSCAR MAYER Deli Fresh Grilled Chicken Breast Strips and substitute your favorite flavor KRAFT Barbecue Sauce for the salsa. Bacon-Corn Salsa and Shaved Turkey Roll-Up: Substitute 16 slices OSCAR MAYER Deli Fresh Oven Roasted Turkey Breast for the chicken breast strips. Bacon-Corn Salsa and Chicken Lettuce Wraps: Substitute 4 large lettuce leaves for the tortillas, folding in both sides of each lettuce leaf as you roll it up.